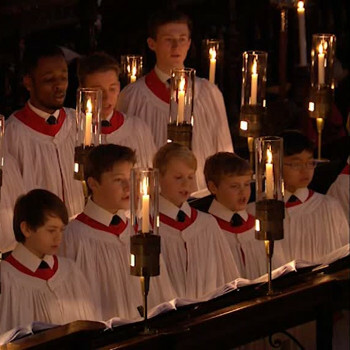 2018 has seen two major milestones at King’s; the centenary of its first Service of Nine Lessons and Carols, conceived on the Truro model by Eric Milner-White and shaped in large part by his harrowing experience as a stretcher-bearer during the First World War, and the handing-on of the torch from Stephen Cleobury to Daniel Hyde, who takes over as Director of Music at King’s next year. It’s therefore entirely fitting that the College’s own label has released a double CD looking both back and forwards. The first disc comprises a newly-recorded “service” with Cleobury and the current choir, featuring recent works by James Whitbourn, Richard Elfyn Jones and others; the second draws on the College’s enormous archival riches with performances dating as far back as 1958 under previous Directors David Willcocks and Philip Ledger, as well as plenty from Cleobury’s own 37-year tenure. The difference in approach and sound is, to say the least, striking; I was reminded in particular of archive recordings of Her Majesty the Queen’s Christmas addresses, and the changes in vowel-colour that have taken place over the decades. Naturally, the sound of any choir evolves as the membership changes and voices develop, but it’s also clear that each Director has had a definite vision for the choir’s sound. Willcocks’ choir has a touch so light it seems almost unbelievable, with meaty fortes a real rarity and many a delicate staccato; under Ledger there’s an audible trend towards smoother, more legato singing; finally, as we enter the “Cleobury Era” the singers seem to come full circle to something approaching the full-blooded, semi-soloistic singing referred to in the notes (and discarded in the 1930s as unfashionably melodramatic). This is of course just a limited selection from the College’s treasure-chest, but even here there are more delights than space permits me to list; Carl Rütti’s bold and funky I wonder as I wander, Judith Weir’s jumpy, expectant Illuminare, Jerusalem, and of course Arvo Pärt’s breathless, blink-and-you’ll-miss-it Bogoroditse Devo, to name just three. One of the hallmarks of Stephen Cleobury’s tenure was the regular commissioning of a new carol for each year’s service, adding to the existing body of Christmas music available to choirs. Complementing these are a generous serving of old favourites, the carols (and, no less important, time-honoured descants) that have become musical lynchpins for an uncountable number of carol services since Willcocks’ time. As a church musician myself I, like many others, am about to start my descent into an exhausting festive maelstrom of frantic learning and preparation, all culminating at the end of December in a feast for the senses. Listening to sixty years of carols from King’s, I’m reminded once again of what makes it all worthwhile.